成臣, 曾勇军, 王祺, 谭雪明, 商庆银, 曾研华, 石庆华, 金霄. 氮肥运筹对南方双季晚粳稻产量及品质的影响[J]. 植物营养与肥料学报, 2018, 24(5): 1386-1395. CHENG Chen, ZENG Yong-jun, WANG Qi, TAN Xue-ming, SHANG Qing-yin, ZENG Yan-hua, SHI Qing-hua, JIN Xiao. Effects of nitrogen application regime on japonica rice yield and quality of the late rice in the double rice system in southern China [J]. Journal of Plant Nutrition and Fertilizers, 2018, 24(5): 1386-1395. Abstract: 【Objectives】 " Indica to japonica” has been regarded as one of the effective measures to improve the rice yield and quality in the double-rice cropping systems in southern China. However, it is unclear how to achieve high yield and good quality of the late season indica-japonica hybrid rice simultaneously by nitrogen application regimes. 【Methods】 Field experiments were conducted in 2016–2017, theindica-japonica hybrid rice Yongyou 1538 was selected as the late season rice material. With the same total N application rate of 255 kg/hm2, nitrogen was applied in three regimes of basal, tiller and panicle fertilizer as 6∶2∶2 (A), 4∶2∶4 (B) and 2∶2∶6 (C). For A and C, the panicle-fertilizer was once applied at the final third leaf stage, whereas for B, panicle fertilizer was twice evenly applied at the final forth leaf stage (B1) and second leaf stage (B2). The dry matter accumulation, yield and quality of japonica rice were investigated and analyzed at harvest stage. 【Results】 Compared with the B treatments, the yield of the A and C treatments were decreased by 1.9%–4.8% and 4.9%–16.8%, respectively, while the yield of the B1 and B2 treatments were increased by 1.2%–3.2% and 3.8%–12.5%, respectively. The total dry matter accumulation of the B, B1 and B2 treatments was significantly higher than that of the A and C treatments (P < 0.05), especially in the heading-mature stage. The main reasons for the strong dry matter production capacity was the high LAI of high effective leaf and effective leaf for the B 1 plots and the high SPAD of flag leaf for the B2 plots during grain filling stage. With the decrease of the proportion of the base fertilizer, the qualities for industrial processing, tasting and cooking and nutrition were improved, but the appearance quality and RVA spectrum became worse. In addition, the qualities for industrial processing, tasting and cooking and nutrition under the same basal-tiller fertilization application ratio were shown as B2 < B 1 < B, while the appearance quality and RVA spectrum characteristic value showed the opposite trend, with the nutrition quality was B 2 > B > B 1. 【Conclusions】 The ratio of basal fertilizer: tiller fertilizer: panicle fertilizer: granular fertilizer as 4∶2∶2∶2 had the highest yields for the late japonica rice, and both the high yield and high quality can be achieved simultaneously with the ratio of basal fertilizer: tiller fertilizer: panicle fertilize of 4∶2∶4, and the split of panicle fertilizer was better than once application under the experimental conditions. 注（Note）：4LFT—倒 4 叶The final fourth leaf；3LFT—倒 3 叶 The final third leaf；2LFT—倒 2 叶 The final second leaf. 注（Note）：表中数据均采用平均值 ± 标准差 Data in the table were mean ± standard deviation；同列数据后不同小写字母表示同一年份不同处理间差异达 5% 显著水平 Values followed by different lowercase letters indicate significant difference among treatments of the same year at 5% level；*—P < 0.05；**— P < 0.01；ns—Not significant. 注（Note）：同列数据后不同小写字母表示处理间差异达 5% 显著水平 Values followed by different lowercase letters indicate significant difference among treatments at 5% level. 注（Note）：表中数据均采用平均值 ± 标准差 Data in the table were mean ± standard deviation；同列数据后不同小写字母表示同一季节不同处理差异达 5% 显著水平 Values followed by different lowercase letters indicate significant difference among treatments of the same year at 5% level；*—P < 0.05；**— P < 0.01；ns—Not significant. 凌启鸿, 张洪程, 丁艳锋, 等. 水稻高产技术的新发展——精确定量栽培[J]. 中国稻米, 2005, (1): 3–7. 任万军. 杂交稻高产高效施氮研究进展与展望[J]. 植物营养与肥料学报, 2017, 23(6): 1505–1513. Ren W J. The research progress and prospects of high yield and high efficiency nitrogen application for hybrid rice[J]. Journal of Plant Nutrition and Fertilizer, 2017, 23(6): 1505–1513. Sun Y, Ma J, Sun Y, et al. The effects of different water and nitrogen managements on yield and nitrogen use efficiency in hybrid rice of China[J]. Field Crops Research, 2012, 127(1): 85–98. 熊正琴, 张晓旭. 氮肥高效施用在低碳农业中的关键作用[J]. 植物营养与肥料学报, 2017, 23(6): 1433–1440. Xiong Z Q, Zhang X X. Key role of efficient nitrogen application in low carbon agriculture[J]. Journal of Plant Nutrition and Fertilizer, 2017, 23(6): 1433–1440. 成臣, 汪建军, 程慧煌, 等. 秸秆还田与耕作方式对双季稻产量及土壤肥力质量的影响[J]. 土壤学报, 2018, 55(1): 247–257. Cheng C, Wang J J, Cheng H H, et al. Effects of straw returning and tillage system on crop yield and soil fertility quality in paddy field under double-cropping-rice system[J]. Acta Pedologica Sinica, 2018, 55(1): 247–257. 林忠成. 氮肥运筹对双季稻产量、品质和氮素吸收利用的影响[D]. 江苏扬州: 扬州大学硕士论文, 2007. Lin Z C. Effects of nitrogen application on yield, quality and nitrogen absorption and utilization in double-cropping rice[D].Yangzhou, Jiangsu: MS Thesis of Yangzhou University, 2007. 王秀斌, 徐新朋, 孙静文, 等. 氮肥运筹对机插双季稻产量、氮肥利用率及经济效益的影响[J]. 植物营养与肥料学报, 2016, 22(5): 1167–1176. Wang X B, Xu X P, Sun J W, et al. Effects of nitrogen application on yield, nitrogen use efficiency and economic benefit of double-cropping rice by mechanical transplanting[J]. Journal of Plant Nutrition and Fertilizer, 2016, 22(5): 1167–1176. 李刚. 氮肥运筹对双季稻产量、品质及吸氮特性的影响[D]. 扬州: 扬州大学硕士学位论文, 2006. Li G. Effects of distribution patterns of nitrogen fertilizer on yield, quality and nitrogen uptake of rice in double-cropping system[D].Yangzhou, Jiangsu: MS Thesis of Yangzhou University, 2006. 张军, 张洪程, 霍中洋, 等. 不同栽培方式对双季晚粳稻产量及温光利用的影响[J]. 中国农业科学, 2013, 46(10): 2130–2141. 郭保卫, 李超, 韦还和, 等. 不同株高类型甬优系列籼粳杂交稻产量差异及其形成机理[J]. 核农学报, 2013, 46(10): 2130–2141. Guo B W, Li C, Wei H H, et al. Yield difference and its formation mechanism of indica-japonica hybrid rice of yongyou series in different types of plant height [J]. Journal of Nuclear Agricultural Sciences, 2013, 46(10): 2130–2141. 许轲, 张军, 张洪程, 等. 双季晚粳稻氮肥精确运筹研究[J]. 植物营养与肥料学报, 2014, 20(5): 1063–1075. Xu K, Zhang J, Zhang H C, et al. Nitrogen managements of late japonica rice in double-cropping rice area [J]. Journal of Plant Nutrition and Fertilizer, 2014, 20(5): 1063–1075. 陈波, 周年兵, 郭保卫, 等. 江西双季晚稻不同纬度产量、生育期及温光资源利用的差异[J]. 中国农业科学, 2017, 50(8): 1403–1415. Chen B, Zhou N B, Guo B W, et al. 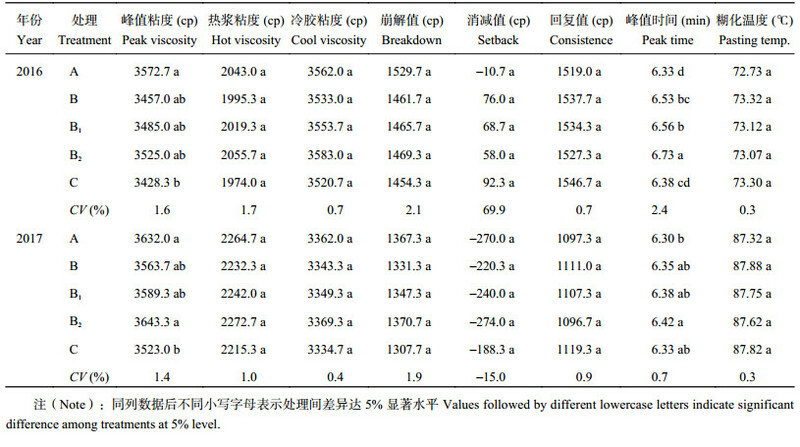 Differences of double-cropping late rice in yield, growth stage and utilization of temperature and illumination in different latitudes of Jiangxi province[J]. Scientia Agricultura Sinica, 2017, 50(8): 1403–1415. 林忠成, 李土明, 吴福观, 等. 基蘖肥与穗肥氮比例对双季稻产量和碳氮比的影响[J]. 植物营养与肥料学报, 2011, 17(2): 269–275. Lin Z C, Li T M, Wu F G, et al. Effects of nitrogen application on yield and C/N of double-cropping rice[J]. Plant Nutrition and Fertilizer Science, 2011, 17(2): 269–275. 张祥明, 郭熙盛, 李泽福, 等. 氮肥运筹方式对晚稻产量、品质和氮素利用率的影响研究[J]. 土壤通报, 2008, 39(3): 576–581. 霍中洋, 万靓军, 张洪程, 等. 不同施氮比例对杂交水稻产量及品质的影响[A]. 中国作物学会栽培专业委员会换届暨学术研讨会论文集[C]. 山东泰安, 2007. 203–209. Huo Z Y, Wan L J, Zhang H C, et al. Effects of different nitrogen fertilization rates on yield and quality of hybrid rice[A]. Proceedings of the Chinese Society of Crop Cultivation of Professional Committee of the Transition and Academic Symposium[C]. Tai'an Shandong, 2007. 203–209. 胡群, 夏敏, 张洪程, 等. 氮肥运筹对钵苗机插优质食味水稻产量及氮素吸收利用的影响[J]. 作物学报, 2016, 42(11): 1666–1676. Hu Q, Xia M, Zhang H C, et al. Effect of nitrogen application regime on yield, nitrogen absorption and utilization of mechanical pot-seedling transplanting rice with good taste quality[J]. Acta Agronomica Sinica, 2016, 42(11): 1666–1676. 陈海飞, 冯洋, 徐芳森, 等. 秸秆还田下氮肥管理对中低产田水稻产量和氮素吸收利用影响的研究[J]. 植物营养与肥料学报, 2014, 20(3): 517–524. Chen H F, Feng Y, Xu F S, et al. Effect of nitrogen fertilizer managements on rice yield and nitrogen uptake in medium and low yield fields under the conditions of straw turnover[J]. Journal of Plant Nutrition and Fertilizer, 2014, 20(3): 517–524. Ni L, Jiang Y, Shi W. Influence of nitrogenous fertilizer control on direct seeding rice yield and quality[J]. Advances in Information Sciences & Service Sciences, 2012, 4(23): 805–813. 白洁瑞, 邱淑芬, 李勇, 等. 氮肥分期施用对机插稻产量构成及氮肥利用率的影响[J]. 中国土壤与肥料, 2016, (5): 45–49. Bai J R, Qiu S F, Li Y, et al. Effects of N fertilizer application times on yield formation and N use efficiency of machine-transplanted rice[J]. Soil and Fertilizer Sciences in China, 2016, (5): 45–49. 许晶, 赵宏伟, 杜晓东, 等. 氮肥运筹对寒地粳稻氮肥利用率及产量影响的研究[J]. 作物杂志, 2011, (3): 86–90. 杨安中, 吴文革, 李泽福, 等. 氮肥运筹对超级稻库源关系、干物质积累及产量的影响[J]. 土壤, 2016, 48(2): 254–258. Yang A Z, Wu W G, Li Z F, et al. Effects of nitrogen application on source-sink relationship, dry matter accumulation and yield of super hybrid rice[J]. Soils, 2016, 48(2): 254–258. 胡群, 夏敏, 张洪程, 等. 氮肥运筹对钵苗机插优质食味水稻产量及品质的影响[J]. 作物学报, 2017, 43(3): 420–431. Hu Q, Xia M, Zhang H C, et al. Effect of nitrogen application regime on yield and quality of mechanical pot-seedlings transplanting rice with good taste quality[J]. Acta Agronomica Sinica, 2017, 43(3): 420–431. 陈梦云, 李晓峰, 程金秋, 等. 秸秆全量还田与氮肥运筹对机插优质食味水稻产量及品质的影响[J]. 作物学报, 2017, 43(12): 1802–1816. Cheng M Y, Li X F, Cheng J Q, et al. Effects of total straw returning and nitrogen application regime on grain yield and quality in mechanical transplanting japonica rice with good taste quality [J]. Acta Agronomica Sinica, 2017, 43(12): 1802–1816. 潘圣刚, 翟晶, 曹凑贵, 等. 氮肥运筹对水稻养分吸收特性及稻米品质的影响[J]. 植物营养与肥料学报, 2010, 16(3): 522–527. Pan S G, Zhai J, Cao C G, et al. Effects of nitrogen management practices on nutrition uptake and grain qualities of rice[J]. Plant Nutrition and Fertilizer Science, 2010, 16(3): 522–527. 万靓军, 张洪程, 霍中洋, 等. 氮肥运筹对超级杂交粳稻产量、品质及氮素利用率的影响[J]. 作物学报, 2007, 33(2): 175–182. 刘立军, 王志琴, 桑大志, 等. 氮肥运筹对水稻产量及稻米品质的影响[J]. 扬州大学学报(农业与生命科学版), 2002, 23(3): 46–50. Liu L J, Wang Z Q, Sang D Z, et al. Effect of nitrogen management on rice yield and grain quality[J]. Journal of Yangzhou University (Agricultural and Life Sciences Edition), 2002, 23(3): 46–50. 徐大勇, 金军, 杜永, 等. 氮磷钾肥运筹对水稻子粒蛋白质和氨基酸含量的影响[J]. 植物营养与肥料学报, 2003, 9(4): 506–508. 刘代银, 伍菊仙, 任万军, 等. 氮肥运筹对免耕高留茬抛秧稻氮素吸收、运转和子粒品质的影响[J]. 植物营养与肥料学报, 2009, 15(3): 514–521. 丁得亮, 刘玉亮. 氮肥施用时期和施用量对水稻产量和食味品质的影响[J]. 天津农学院学报, 2008, 15(1): 1–3. 万靓军, 霍中洋, 龚振恺, 等. 氮肥运筹对杂交稻主要品质性状及淀粉RVA谱特征的影响[J]. 作物学报, 2006, 32(10): 1491–1497. 张军, 张洪程, 段祥茂, 等. 地力与施氮量对超级稻产量、品质及氮素利用率的影响[J]. 作物学报, 2011, 37(11): 2020–2029.